Thanks for all the wonderful birthday wishes. Husband made me this beautiful wine glass holder. 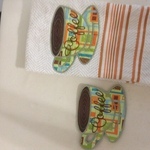 I have been working on valentine coasters and mug rugs. Also #3 and 4 are a tortilla warmer made using the circular attachment and decorative stitches on the machine. Lots of fun. Hugs.